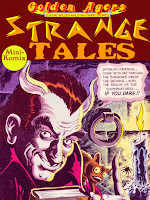 Golden Ages tells some Strange Tales from the past! We've got two tales from Mr. Dedd with ghosts and werewolves, Captain Video mashes mad science, a man hunts dinosaurs, Quimby the Barbarian gets virtual, Mr. Mystic fights rigged boxing, harsh hillbillies in A Good Daughter, an odd look at Spring-Heeled Jack, the Ghosts Of Snaggle Castle drive out detectives, Victorian mystery in Two Bottles Of Relish, Grimm-Ghost Doctor investigates a murder, aliens reach the Primal Equation, Mr. Bones recants a scary story, Golden Arrow aims for the devil, Ibis the Invincible busts a ghost, a dog-man joins the circus in Wood Woof, and Doctor Graves checks into a haunted dog. Super-science and supernatural smash for another strange comic! 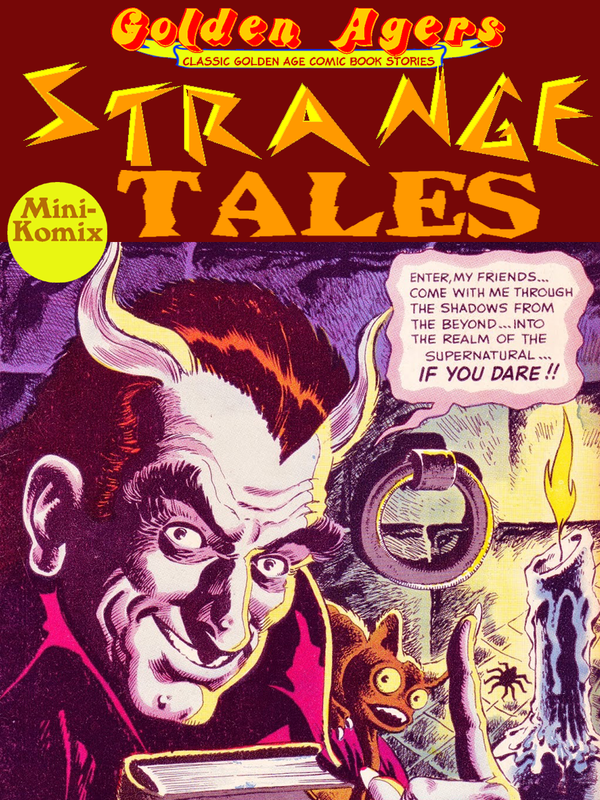 You can download this now at Lulu and Drive Thru Comics, plus as part of the Golden Agers: Strange Series Bundle. 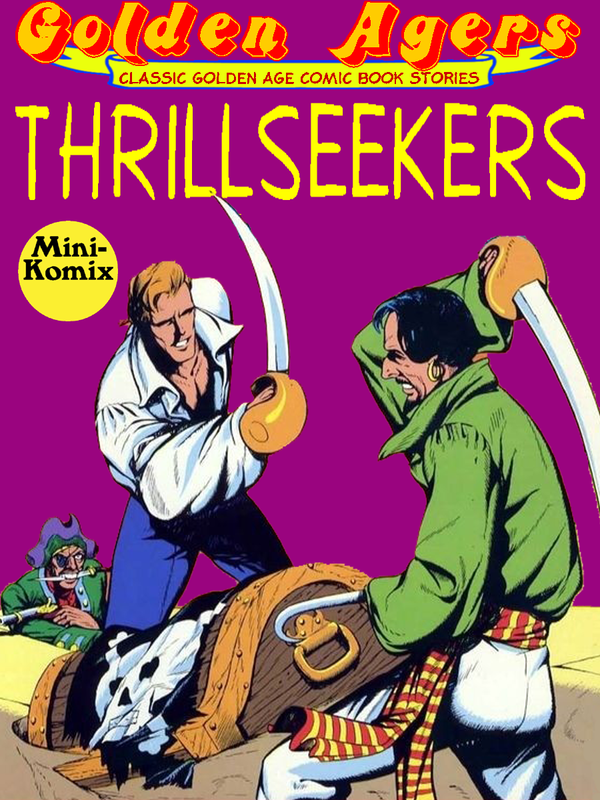 Golden Agers seeks the most thrilling Thrillseekers in comics! Two costumed mirth-makers fight crime in Masquerade, Phantom Rider drives into danger, gypsy girl Flamingo is drawn into a deadly mystery, Mr. Dedd plays Hide and Eeeeek, Johnny Dynamite solves a murder and hunts for refugees in the jungle, cowboy Bob Colt encounters men from space, The Boy Explorers discover an island of amazons, Davy Crockett defends the frontier, and pirate captain Hawk battles the Skull Lady. Bone-chilling thrills for all action fans! 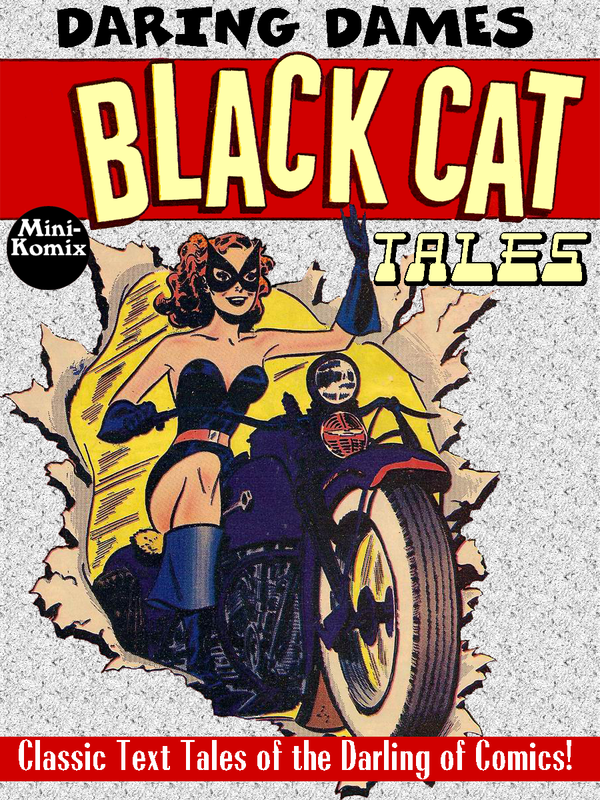 You can download this now at Lulu.com and Drive Thru Comics, plus as part of the Golden Agers: Adventure Collection Bundle. Klassik Komix introduces you to the Legends of Yesterday featuring some of the greatest heroes from the Golden Age of Comics! Featuring: Spy Smasher, Sheena-Queen of the Jungle, Yankee Girl, Masquerade, Diana the Huntress, Six Gun Smith, Spacehawk, Kitty Kelly, Tara, Shock Gibson, War Nurse, and more! 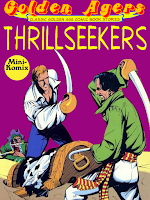 Thrilling action and adventures in this blast from the past! You can order this is from us, and from Lulu.com. 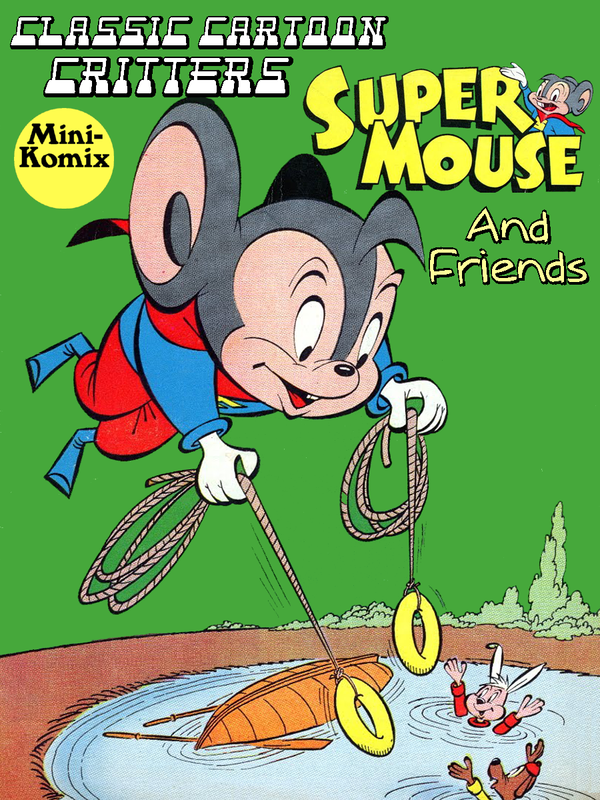 Classic Cartoon Critters crawls out more funny animals from the Golden Age of Comics with Supermouse and Friends! 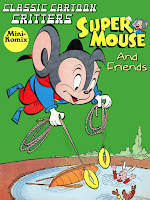 This mouse of might brings along some of the rest of the zoo crew, including: Tom the All-American Cat, Atomic Mouse, Atomic Rabbit, Lil' Rabbit, Lil' Foxes, Mugsy, Fuzzy, Buzzy Bee, Kenny Kangaroo, Willie the Worm, Lil' Mouse, Prof. Invento, Count Gatto, Shadow, Bagshaw Bear, Pudgy Pig, Sherlock Monk, and more! Fine furry friends from the 40s & 50s! You can download this now at Drive Thru Comics, as well as part of the Classic Cartoon Critters Bundle. Kazoo Komix collects some of the greatest "funny animal" stories from the Golden Age of comics! 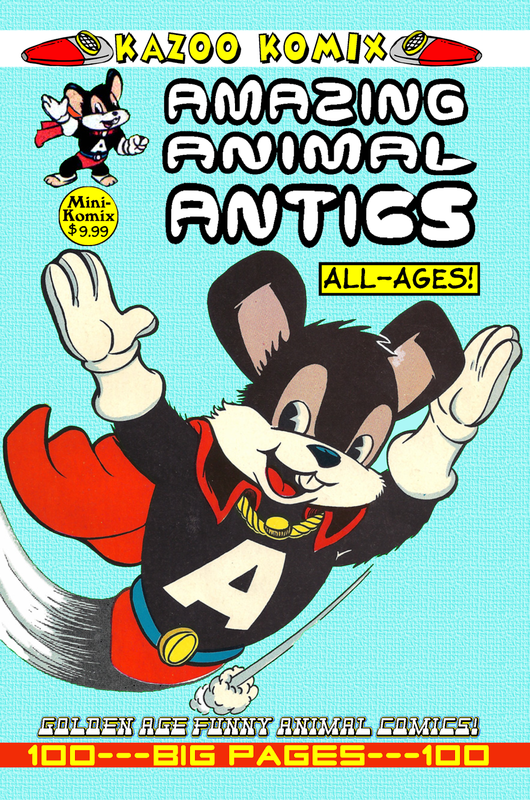 Superheroes like Atomic Mouse, Atomic Bunny, and Atom the Cat! Plus: Fatso Pig, Lil' Foxes, Butch O' Sparrow, Willie the Worm, Lil' Lumberjack, Wilfred, Cubby Bear, Sherlock Duck, Lil' Rabbit, and Merryville! All-ages cartoon fun for everyone! 100 Big Pages! This is available through us, and from Lulu.com. Golden Agers assembles some of Earth's mightiest defenders in Heroes Crossover. Uncle Sam pulls together Spacehawk, Target, White Streak and other heroes to protect America. 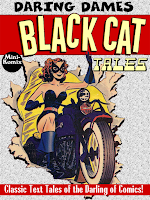 The original Black Cat teams-up with War Nurse, Shock Gibson, and Captain Freedom to prevent a U.S. invasion. Black Owl, Green Lama, Doctor Frost, Yank and Doodle unite to fight Frankenstein! Black Terror and Timmy are introduced to the masked vigilante, Red Anne. Hydroman meets Rainbow Boy in his premiere story. The original Daredevil rallies Lance Hale to hunt down Hitler. Destiny avenges the death of the mysterious 711. The evil Super-Brain faces the Rangers of Freedom, and then later in the future against Mysta of the Moon. Get ready for some of the greatest cosmic crossovers in the history of comics! 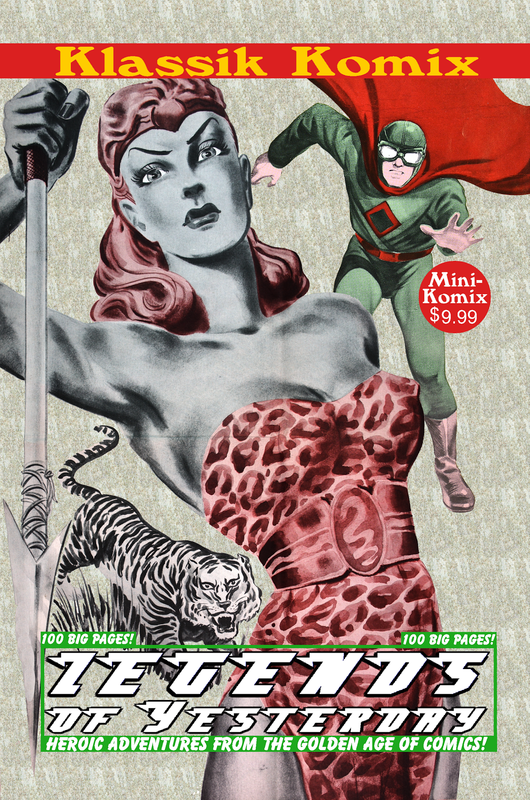 You can download this now at Lulu.com and Drive Thru Comics, as well as part of the Golden Agers: Heroes Collection Bundle. 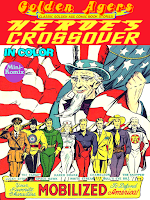 Golden Agers teams up the best good guys of yesterday for Heroes United! 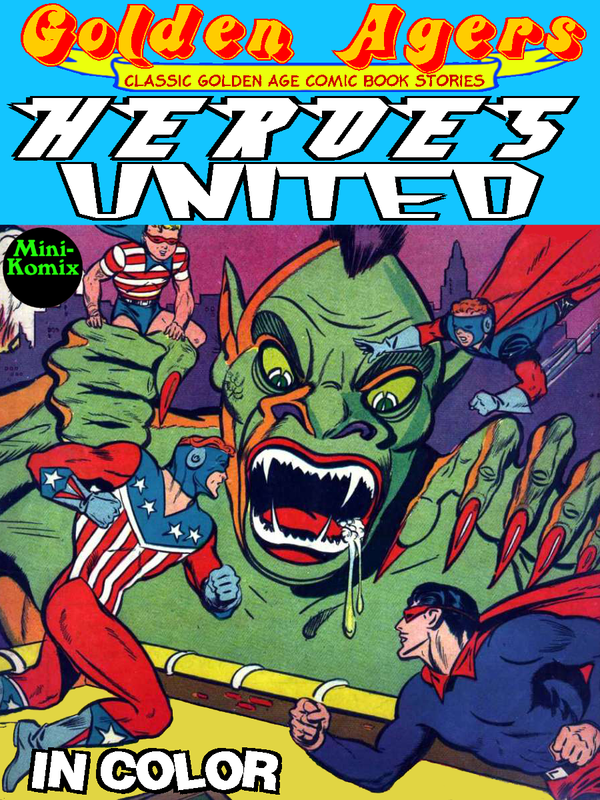 The Wizard and The Shield meet up, Bulletman is introduced to Captain Marvel Jr., Fatman clashes with Tin Man, Dollman dates Dollgirl, Pat Parker-War Nurse forms the Girl Commandos, Cat-Man's Kitten and The Deacon's Mickey form the Little Leaders. Alliances are formed decades before the Justice League or Avengers! 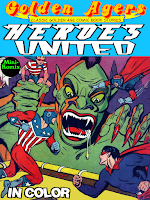 You can download this now at Lulu.com and Drive Thru Comics, as well as part of the Golden Agers: Heroes Collection Bundle.